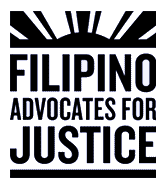 Filipino Advocates for Justice (FAJ) board of directors and staff is very pleased to announce the hiring of a new executive director, Geraldine Alcid. Starting March 6, she will be stepping into the role that Lillian Galedo has held for nearly 40 years. As Lillian has done, Geraldine will continue to lead FAJ in the spirit of Bayanihan (people helping people) to foster a Filipino community with the power to advance social and economic justice, and to realize democratic and human rights for everyone. Geraldine is keenly aware that the organization and its allies are facing a new political reality that will pose new and greater challenges in our fight for social and economic justice for all. She is eager to ensure that FAJ can be a powerful partner in this fight. We are confident that Geraldine’s experience, organizational knowledge, and values of shared leadership, social justice and collaboration are a great match for the work, staff, and the greater FAJ community. Her leadership and management qualities will support Geraldine as a skillful change agent to preserve the core mission and programming while taking FAJ to its next levels of organizational infrastructure, strategic direction, and resource development. If Geraldine’s name sounds familiar to you, it’s because she has deep roots with FAJ. She served as Program Director for FAJ from 2006 – 2012, focusing on FAJs civic engagement work. In that role, she provided leadership in numerous voter engagement efforts, including new access to Filipino voter data and shared state-wide analysis, Filipino voter mobilization and GOTV in multiple elections from2006-2012, participating in the Tagalog Language Advisory of Alameda County’s ROV, and coordinating volunteers with the Asian Law Caucus who poll monitored for language access. She also led FAJ’s outreach for the 2010 census. After leaving the Bay area briefly, she returned and worked alongside Lillian on fund development for FAJ. The search process was a challenging undertaking. The board and staff both are cognizant of the challenges we all face in the years ahead. It is clear to us that the successful transition from Lillian to Geraldine will require thoughtfulness and care. Lillian has agreed to support that transition through June of 2017 in a part time capacity. During this transition we know that Lillian’s support will embody the values she has brought to the job for nearly 40 years – empowerment, collaboration, leadership development, community organizing and advocacy. We also know that after June, Lillian will continue to be on the front lines of social justice and will forever be FAJ’s ally in our relentless fight for justice.